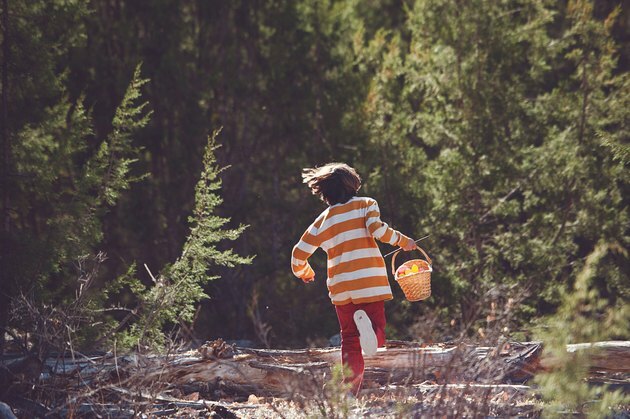 Beyond the traditional Easter egg hunt, there are other fun outdoor games to consider. Most Easter games use basic supplies, making them simple and inexpensive to coordinate. The games can also lend themselves well to indoor versions. This allows you to move the Easter activities indoors if the weather does not cooperate. An Easter-themed obstacle course gets everyone moving. Each player needs a spoon and either a hard-boiled egg or a plastic Easter egg. The players balance the egg on the spoon while navigating an obstacle course set up in the backyard. Ideas for obstacles include sawhorses to climb under, Easter baskets to weave through and plastic eggs scattered on the ground that the players have to tiptoe around to avoid smashing them. Each player needs a different colored hard-boiled egg for this game. Place one white hard-boiled egg in the middle of the lawn or patio. Each player takes a turn rolling his hard-boiled egg. The goal is to get the colored egg to stop closest to the white egg. Keep extras of each color on hand in case one of the eggs cracks or gets squashed during the game. This outdoor Easter game requires players to toss eggs back and forth without dropping them. Any type of egg works for this game, including raw, hard-boiled or plastic eggs. Real eggs, whether or not you boil them, will make a mess when dropped or tossed too hard, adding a layer of messy fun to the game. Pairs of players start close together with only a few feet between each member of the pair. After successfully tossing and catching the egg, the pairs move back a step each for a greater distance and another toss. Continue widening the gap to make the game more of a challenge. 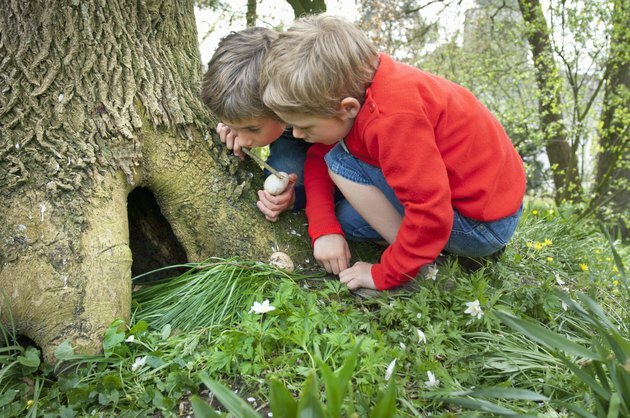 Give a regular Easter egg hunt a twist for an interesting outdoor game. 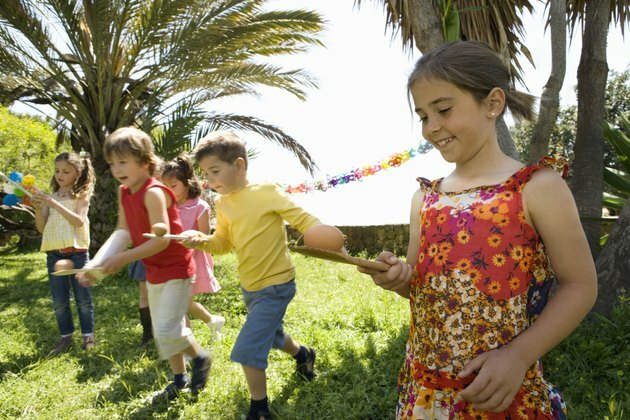 One option is to organize a treasure hunt instead of an Easter egg hunt. Create a map with locations marked for different Easter treats. You might leave eggs, baskets or small Easter toys in each marked location. Include a larger basket at the end of the treasure hunt. Another variation is to write a letter on each egg. After the kids collect their eggs, they use the letters to spell out as many words as possible. A special prize goes to the child who creates the most words from her letters.